4 Full Days of camp designed for youth who want a more in depth experience with climbing and outdoor skills. This camp will begin with the basics of climbing and progress to more advanced rope climbing, bouldering, rappelling, and other climbing activities. Youth will also receive in depth instruction into outdoor skills such as navigation, teamwork, camping and more. 4 Half Days offered as a great introduction to climbing. Kids will learn the fundamentals of rope climbing, bouldering, slack lining, and many other skills related to climbing. Youth will also participate in team building games that focus on communication skills, problem solving, and trust. Intro to Climbing class is available by appointment on Saturday and Sunday at 11am and 4pm. Climb Tulsa has Tulsa's largest in stock selection of recreational climbing gear. We are the proud retailers of some of the leading manufacturers of climbing gear in the world and we work hard to have a large supply. 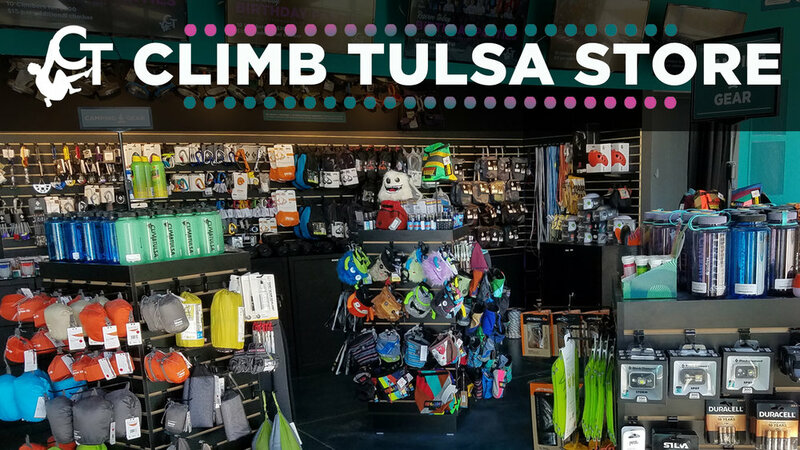 From climbing shoes, harnesses, rope, and trad gear to quickdraws, chalk bags, and training boards we have it all at Climb Tulsa. Yoga is an excellent way to improve balance, flexibility, breath control, and core strength. This makes the practice not only beneficial to your overall well being, but may be the key to taking your climbing to the next level. Climb Tulsa is proud to host some of the best instructors that Tulsa has to offer. At Climb Tulsa we are all about developing new skills as well as practicing the skills we have already learned. That's where our classes and coaching come in. We want to teach you everything you need to know to have fun and develop as a climber. We have classes for the absolute beginner all the way up though the experienced climber that still wants to step it up another notch. Whether you are new to climbing or looking to take your skills to the next level, everyone would benefit from one on one time with a Climb Tulsa coach. Our coaches have a passion for helping their clients develop the techniques and stamina they need to reach their goals. Our groups and parties include instructors will be present with the group to provide belaying and to help coach participants up the different types of climbs. Separate private room available with chairs and tables available for your use. Climb Tulsa will provide harnesses for all participants! Did you know Climb Tulsa members climb all over the planet. We are proud to say that right here from little old Tulsa we have men and women climbing some of the most challenging routes across the globe. If you are interested to learn more be sure and attend our members only slide shows happening every few months to hear the climbing stories from the climbers themselves. We love climbing and we love each other. There is one thing above all that we strive for at Climb Tulsa and that is to be welcoming to our guests. Safety, cleanliness, and phenomenal climbing areas are critical but the icing on the cake is the smiles we hand out daily. Can't wait to meet you! Most Climb Tulsa Members find climbing to be the perfect excuse for road trips all over the world. If you are in need of a hobby that brings more adventure in your life consider climbing.